Experts recommend using facing bricks as an improvement in the appearance of the house. This will solve another problem, which is to improve the insulating qualities of the building. You can brick a house out of a timber qualitatively, if you take into account the masonry rules, because even after the work, the house must continue to "breathe." 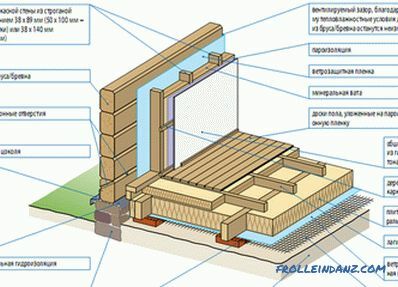 Scheme of thermal insulation of walls from a bar. 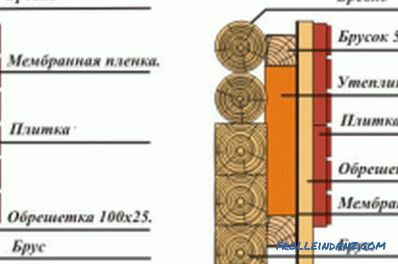 Scheme of options for warming log and bar-shaped walls. A brick house is ennobled with a brick so that the final thickness of the masonry is 1/4 or 1/2 of the thickness of the product. To carry out this is possible only in the presence of a ledge, on it and will lay clutch. 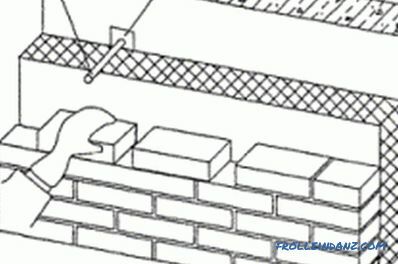 Before laying a brick over the building, it should be noted that the ledge should be located slightly below the bottom wall trim made of wood; as an alternative arrangement of the ledge, you can use a place below the starting rim. If you do not take into account this requirement, moisture will accumulate on the ledge, which will entail undesirable consequences. It should be remembered that brick and wood are completely different in structure and composition of materials, this causes a different degree and speed of their shrinkage. Among other things, in the wood for a long time the process of changing the moisture content is carried out, it ultimately affects its appearance, as well as linear dimensions. So, after cycles of swelling and drying, wood is able to deform, unlike brick. 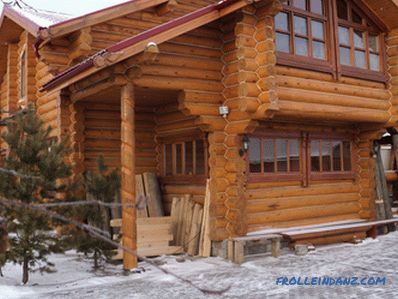 Proceeding from the above-mentioned features, the facing works of the log houses should start after the complete shrinkage of the building, which can take up to 3 years. The house from a bar should be lined so that the upper line of the masonry does not reach the height of the walls by 1-1.5 cm humidity. A house from a bar can be protected with a brick using one of the existing technologies. The first involves the use of bricks in tandem with a lining of insulation, which has a protective sheath. The second one provides for the creation of a so-called ventilation facade, for which, in the process of work, a space is created between the wall of the main building and the cladding that provides movement of air masses. 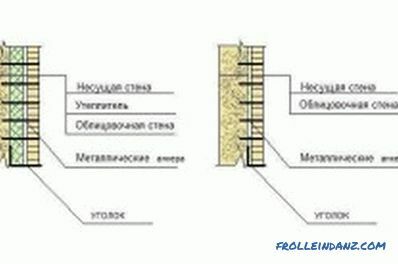 Technical characteristics of facing bricks. A house from a timber can be started to be revetted if it has a solid tape-like foundation. 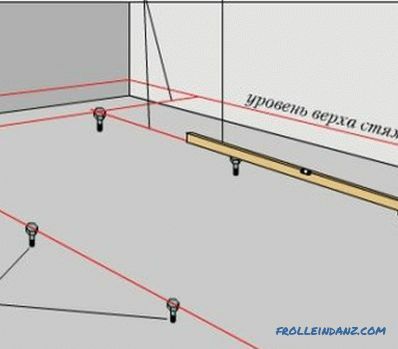 If there is a blind area, it cannot be applied as a base. A house of timber may not have a sufficient width of the foundation for work, then you can resort to laying the strip base, which will be intended for laying. Its width should be equal to 13-15 cm, as a more acceptable option, it is preferable to use a width of 20-25 cm. It is worth remembering that such a solution in the form of a laying of an additional foundation is not the best option, since different parts the resulting basement will shrink. This can cause the building to skew; cracks can form at the base and walls, and a mismatch of openings in the main and facing walls can be obtained. The waterproofing should be laid on the foundation; in its quality, traditional roofing material can be used. It should be mounted in 2-3 layers, moreover, it is necessary to ensure the protrusion of the material beyond the base by an average of 5 cm on both sides. The lining of the building involves the laying of a heat insulator, which should be fixed on the walls. Mineral wool, which is produced in sheets, has proven itself very well. If you want to save, you can use the budget option of warming, for which you should apply expanded clay, it will fall asleep in the process. Bricked up a wooden building with the use of solutions of different composition. It can be mixtures based on cement, limestone, clay. As the best option, you can use cement mortar. The brand of the final mortar depends on the grade of cement used in the work. This dependence is directly proportional: the higher the grade of cement, the higher the strength of the mixture for laying. Before you start using the solution, you should check it for mobility, during which you must apply a cone, whose weight is 300 g, height - 15 cm, and the apex angle is 30 °. 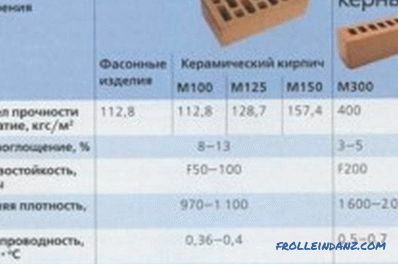 So, mobility is determined by the depth of immersion of the tool in the finished mixture.If a hollow brick is supposed to be used in the work, the mobility index should be 7-8 cm, and for solid products the index can vary from 9 to 13 cm. Mobility indicates the ability of the mixture to spread under the influence of its weight. Before you brick over a house, you should prepare the mortar. Thus, to obtain a lime-cement mixture, it is necessary to use 1 part of cement M-500, 2 parts of lime dough and 8 parts of sand. To prepare the cement mixture, you must use 1 part of cement M-500 and 4 parts of sand. Another way to prepare the solution involves adding to the composition of the adhesive, which is necessary to increase the strength properties; liquid soap can also be added, which guarantees an increase in plasticity and prevents excessive fluidity. To obtain such a mixture, it is necessary to use 4 parts of sand, 1 part cement M-500, 0.5 parts of Flizenkleber glue and some liquid soap. Such a solution will be more expensive than the previous ones, however, the quality characteristics fully compensate for this disadvantage. In addition to the above advantages, such a composition will not become detached from the products, and its waterproofing characteristics will be excellent. You can trim a brick in the process of work with a hammer-pick, a trowel or trowel acts as the main masonry tool, they need to be spread, and after that the mixture is leveled on the products. It is possible to cut joints, and to clean the ventilation and smoke holes, smooth out and fill the joints in the channels with a mop. It looks like a rubber plate that is hardened between the flanges. To control the verticality and horizontal masonry, you must use the measuring and measuring tools: plumb and level. The angles of the masonry, when encased by a brick house, must also be checked, for this a square can be used. In order to ultimately seams learn the same and aesthetic, should be used cord-mooring. It is recommended to check the straightness of the masonry with a batten-order, the length of which is also equal to 2 meters, its section should be equal to 50x50. 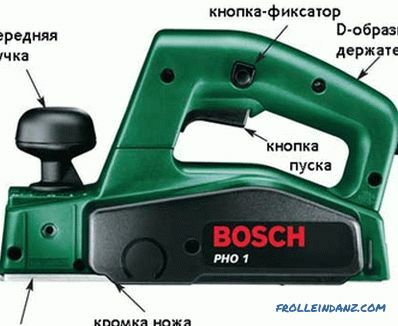 In addition, the tool must have notches for each row, which are necessary for marking the masonry. 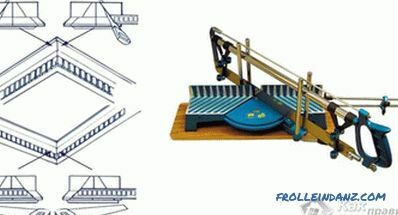 Fastening the rail-order to the brick surface can be made using brackets with a transverse bar. 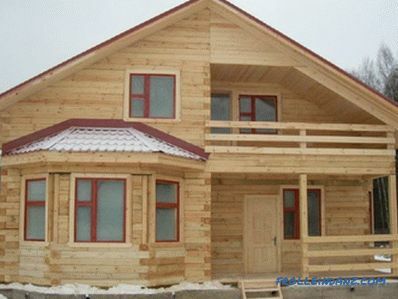 It is necessary to brick a house in polisdeli. Thus, in the end, the wall thickness will be equal to 12.5 cm. In some cases, the brickwork is made in a quarter of a brick, the product must be installed on the edge, and the thickness of the brickwork will be 6.5 cm. brick can be on the ledges of the base. The cladding wall should be connected with the main clamps made of galvanized roofing steel, you can use nails or pieces of steel wire. It is preferable to use galvanized, because the ordinary metal will be destroyed by condensate. One end must be fixed to the main wall, the other - placed in the seam of the masonry. Fasteners can be placed in 2 rows with a pitch that does not exceed 1 m. While facing a beam, moisture-proof products should be used. A distance should be provided between the wall and the wall, the maximum length of which is 10 cm. A ventilation slot of 10-15 mm should be installed in the upper part of the wall; grids can be used to protect them. Laying should be carried out with the dressing of seams, the size of the dressing should not be less than 1/4 of the length of the product. Expansion joints should be placed closer to the corners, the step between them should be 10-14 m.
You can decorate the walls yourself, it is important only to follow all the rules. How to level a wooden floor with your own hands without using complex technologies? For wood flooring, fiberglass leveling compounds are the best and practical option.